It's a long time since I used this book ............................. . At that time I made Fig and white chocolate cookies and I told you that I will review this book when I have a chance to make something from a savory part of the book. And now the time has come ^^. As you know about the author, she is award-winning organic baker, so the recipes in her book represent the same feeling, no fancy dessert can be found here. My first impression for this book is "I like it ^^", there are a lot of photos (almost every recipes come with the photos of the finished product). 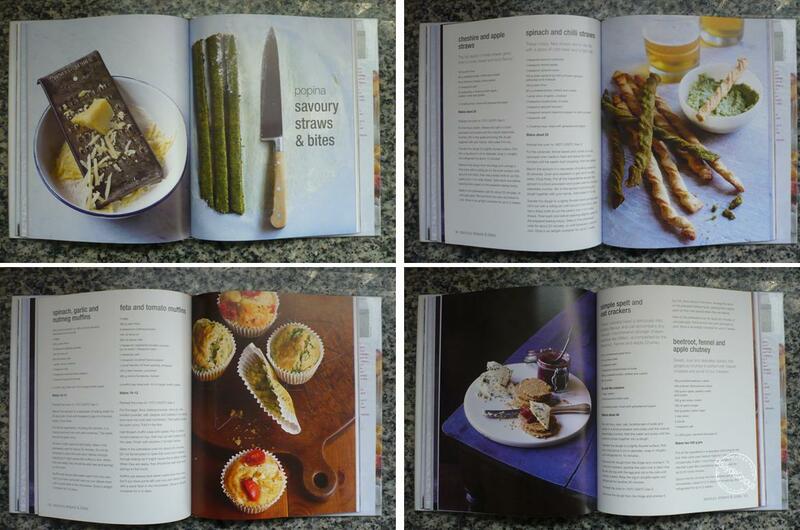 Even I can bake from the cookbook that has no photos at all, I still love to see the photos esp. when the photos are beautiful, it's a bonus, and this book is in this category. I think beautiful photo is one reason for some people to buy this book without knowing about the background of the author. 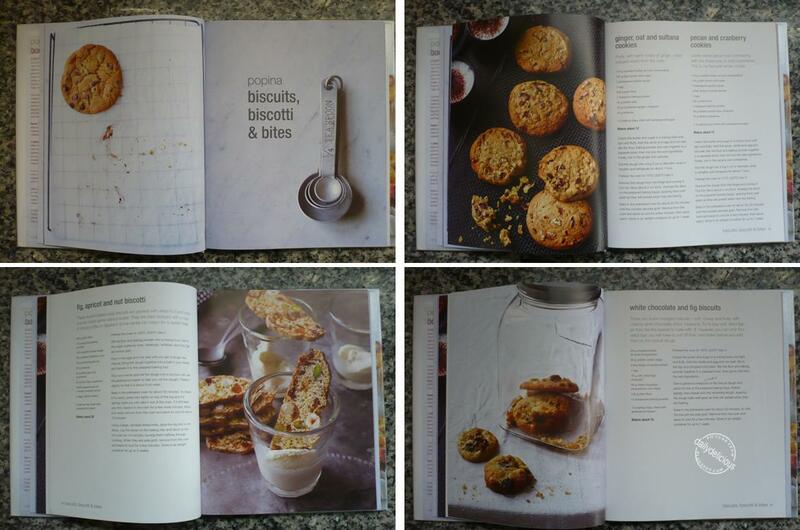 The book start with the Biscuits, biscotti & bites chapter, here you will get 16 recipes of cookies from: ginger, oat and sultana, pecan and cranberry, chocolate chip, oat and raisin, to biscotti : polenta with cherry and nut biscotti, fig with apricot and nut biscotti, then biscuits: white chocolate and fig, ginger and chilli, pineapple with coconut and lemon, spelt with chocolate and hazelnut, walnut shortbreads, hazelnut macaroons, gingerbread, easter egg, granola bars and florentines. Most of them are simple, very easy to make, and yes wholesome. The next chapter is sweet tarts, the first part of the chapter is a 3 kinds of base, sweet shortcrust, chocolate shortcrust, and sponge dough. A lot of the recipes in this chapter use fresh fruits that will be great when they are in season and I don't see any recipe that calls for frozen fruits. Popina recommend that we should buy the fruits from the farmer market when they are in season. The recipes with fruits are apple and plum tart, rhubarb custard and crumble tartlets, fig grape and fragipane tartlets, nectarine and summer berry tart, rustic plum tart and chocolate pear and hazelnut tart . The only three recipes which use the chocolate and nut are chocolate and pistachio tartles, pecan and bourbon tartlets and chocolate and chestnut tart. So, if you can find fresh fruits easily when they are in their season, this chapter will be great. And the book of baking can't be complete with this chapter: Cakes & muffins. 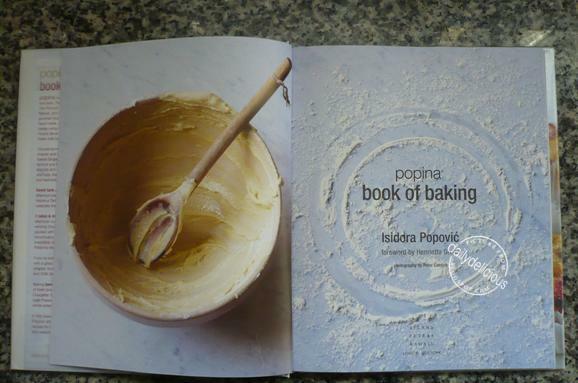 But don't think that you will find any things fancy here, cake for Popina is simple too. The very chocolate cake, Popina carrot cake, lemon loaf with white chocolate icing, and cranberry, cherry and vine fruit cake are all the cake that you can find here ^^, anyway the very chocolate cake looks very tempting for me and I really want to try it soon. She put the recipes for other kinds of sweet right here too, like stolen, chocolate and hazelnut strudel, poppyseed strudel and pumpkin and cinnamon filo strudel, I think because her style is not the sweet queen, but the wholesome and delicious treats from the nature. Like when we look at her muffin recipes, all three of them call for fresh fruit, summer fruit and white chocolate muffins, wholemeal spelt, carrot apple and pumpkin seed muffins and the last one cranberry, orange and pistachio muffin (this is the only recipe that I see the frozen word, haha, for the frozen cranberry). The last part of this chapter devotes to brownies recipe, I think she really love chocolate too ^^, chocolate truffle brownies, cherry chocolate truffle brownies, double orange truffle brownies and the last one white chocolate and coffee truffle brownies. So for 15 recipes in this chapter, I fall in love with the chocolate parts, haha. Next chapter, Savory straws & bites. This chapter is very short, but it packed with a lot of interesting recipes, like Gouda and hazelnut bites, Stilton and celery bites, Cheshire and apple straws, Spinach and chilli straws, Parmesan and seed crackers, Cheddar and chive crackers, Simple spelt and oat crackers and beetroot, fennel and apple chutney, they seen to be great for entertaining event. The 2 recipe for savory muffins, spinach, garlic and nutmeg muffin and feta and tomato muffins looks very delicious, I think they show her own style, they have to contains fresh product like vegetables and cheese. 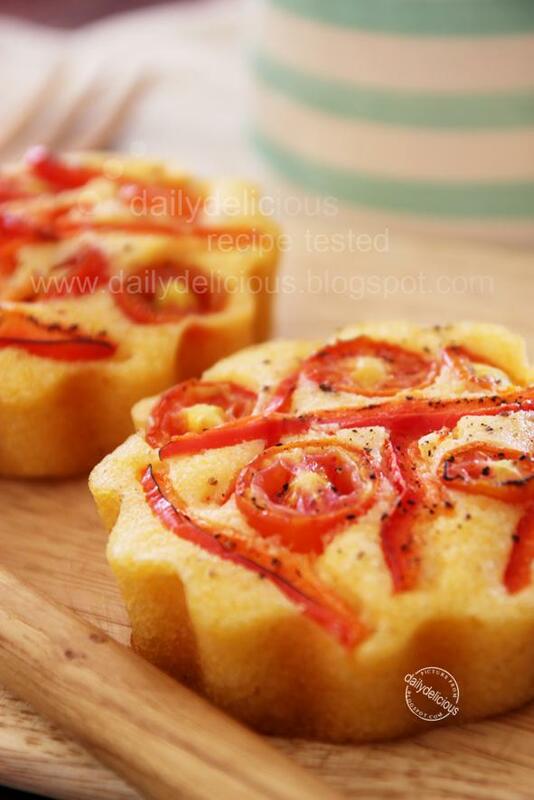 The last chapter, Savory tarts, I like this part the most ^^, all the recipes look great and mouth watering. 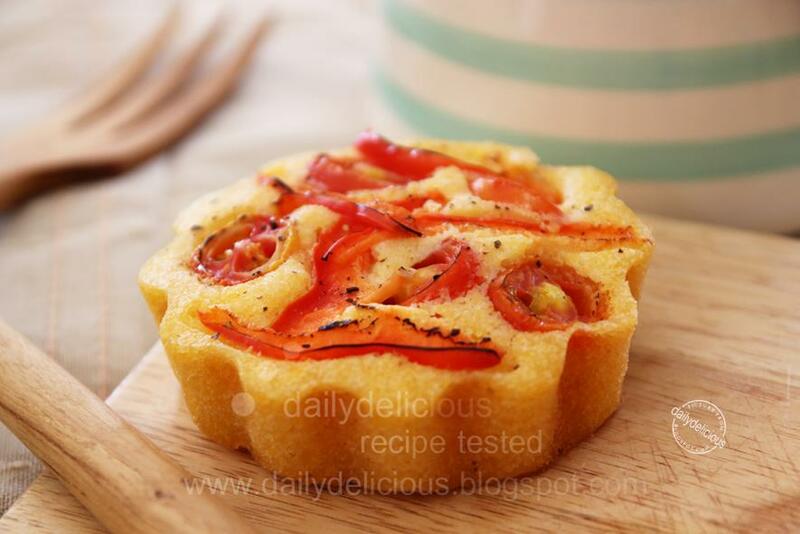 The chapter starts with 3 kinds of base that you will need to know before making any kinds of tart here, there are shortcrust, pizza dough and spelt pizza dough. Then a lot of recipe like Butternut squash and parmesan tart, Goats' cheese, tomato and basil tart, Aubergine, red pepper and tomato tart, Pepper, pecorino and thyme tartlets, Honey-roast parsnip, carrot and shallot tart, Port-poached pear, celeriac, Stilton and walnut tartlets, Mushroom tart, roast potato and Spring onion tartlets, Spinach, feta and tomato quiche, Leek and mature chedder mini quiches, Courgette and fennel tart, Cheese burek, Spinach and cheese burek, Smokey vegetable, butter bean and paprika filo strudels, Little margherrita pizzas with olives, Rustic focaccia with red pepper and onion and Mini cornbread with vegetables. I love this part for the combination that she creates, all of them seen to be great. Anyway, there are no chapter like equipment or ingredients suggestion as many cookbooks do, but I think it's not a problem at all because most of her recipes are easy and straight forward, you don't need anything much to follow and create her recipe, the most important thing is the fresh ingredients that the recipe calls for. I like the way she say in the sweet tarts chapter that all of her recipes are only the suggestion, after reading and having the basic knowledge we can create the recipe that suits our taste and become our own "Masterpiece", read and create sound very good to me, haha. So for me this book is quite good, like a break from the world of sugar ^^, because she gives a lot of savory recipes to choose from. I think that many people have the same problem, when you make a lot of cakes, cookies or anything sweet, no matter how delicious they are, your family member still need a rest from them. And what will I do, I don't stop baking (haha, I really love to bake you can be sure), but I switch to the other part of baking, like making bread or savory treats that anyone can enjoy it as a breakfast or lunch. 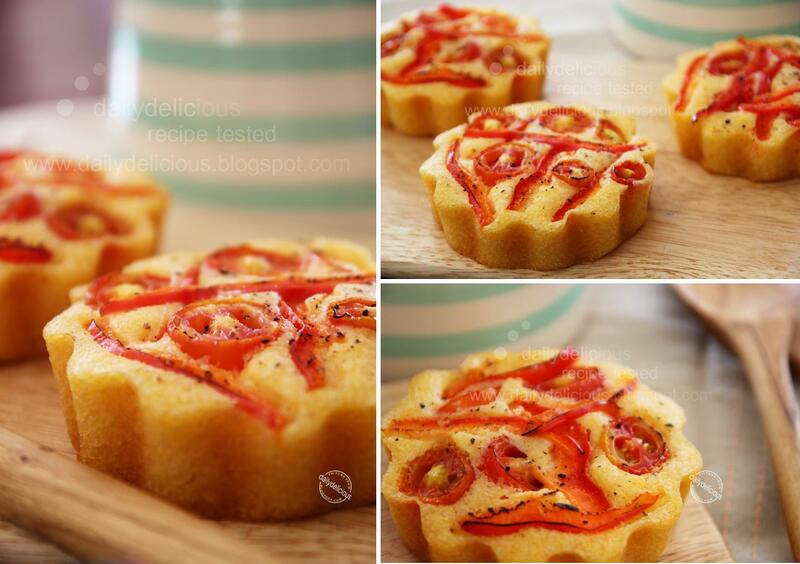 Like this time I choose to make this mini cornbread. It's delicious and very flavorsome, the way of resting the batter before baking really helps to make the cornbread softer (when eating it you don't feel the grainy texture of the cornmeal). Anyway I have a suggestion that if you have tartet tin with removable bottom use them in this recipe, because the cornbread that I use the silicone muffin tin is more soggy than the one in tartlet tin (but if you only have the muffin tin, you can use it but when taking the cornbread out of the tin, you have to be more careful because the moister make the bread more fragile). So after a long text, now I will let you go into the kitchen to enjoy this mini cornbread and yes, we don't have to stop baking, just switch to the savory part, that's all, ^^. 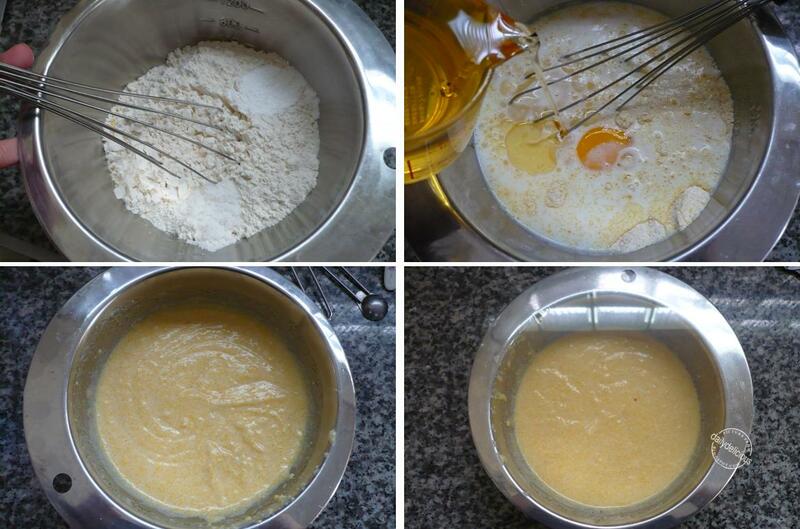 Put the egg yolk, milk, oil, flour, polenta, baking powder and salt in a mixing bowl and whisk well until smooth. 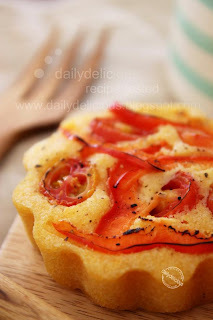 Refrigerate for 30 minutes to allow the polenta to soak up the liquid. this makes for better cornbread. 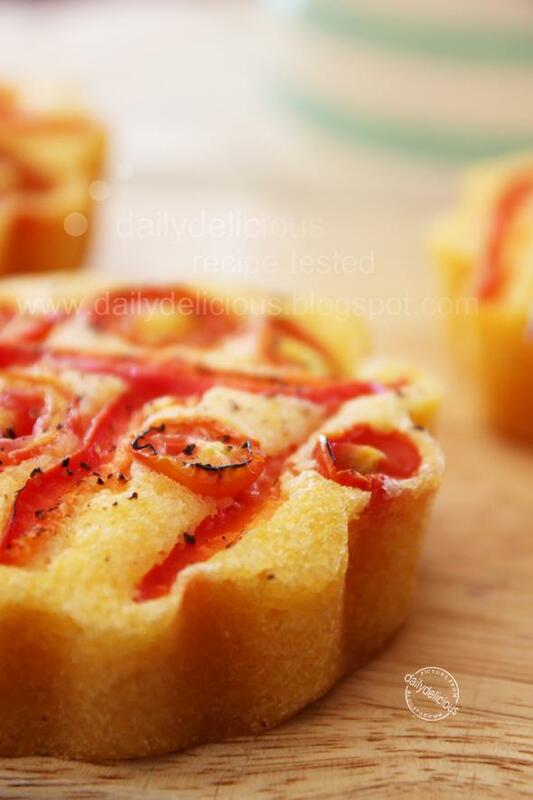 Brush the 8x9cm loose-based fluted tartlet tins, or 8 Texas muffin tins with butter. Remove the cornbread batter from the fridge. 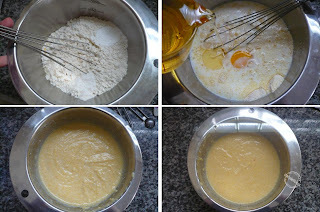 Put the egg white in a separate, grease-free bowl and whisk until it forms stiff peaks, then fold it gently into the batter. Spoon the batter into the tartlet tins almost to the top and scatter the pepper and tomato on top, sprinkle with black pepper. Bake for 15 minutes. Remove from the oven and leave to cool before serving warm. Store in an airtight container for up to 3 days. Great looking cute mini cornbreads..
the cornbread looks great to have for breakfast. Looks Gorgeous :) Came across your site while searching for Popina's book.Do you by any chance have a .pdf version of it?